Tekton Tools 47788 Impact Socket 5/8", 1/2" Dr. 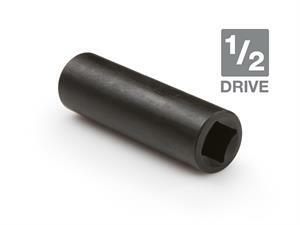 Engineered for use with impact drivers, the TEKTON 1/2 in. Drive Deep Impact Socket has a 6-point opening that snugly fits the hex shape of fastener heads, allowing it to apply maximum torque without slipping. To prevent round-off, it grips the flat sides of fasteners rather than the corners. Easy to read even in low light, the large, high-contrast size marking is permanently laser etched into the steel surface. The through-hole in the drive end locks onto the tang of impact wrenches or drivers so it won’t fall off or stick on fastener heads. To protect against rust and corrosion, the black phosphate finish absorbs and holds oil, repelling moisture.